In the 1960s, when in my late teens, I began to like rhythm & blues music (Chuck Berry, Bo Diddley, Muddy Waters) then folk blues. Arising from that I began to like blues and boogie woogie piano (eg. Jimmy Yancey) then a pal at work introduced me to Oscar Peterson – the iconic Night Train album. That was it – I was hooked on jazz as a listener and began to go to lots of local gigs – mostly traditional jazz but gradually more modern styles too. I had played guitar as a teenager, Shadows tunes and Chuck Berry style R&B, but then I heard the great jazz guitarist George Barnes – the quartet with Ruby Braff. I loved his playing, went out and bought a cheap jazz guitar and started again from scratch, trying to learn to play like Barnes, playing along with albums mostly. By then I was aged in my late 20s so I left it late to get started. After two or three years woodshedding some pals told a local jazz musician I played. This musician lived nearby – he was Clem Avery, a lovely person and player who became a father figure in my jazz development. Clem got me some 'sit ins' with local bands including Joe McMullen's Mainstreet Jazzmen, Hughie Aitchison's Cellarmen, Peter Gascoigne's Vieux Carre and Ronnie Young's Jazzmen. 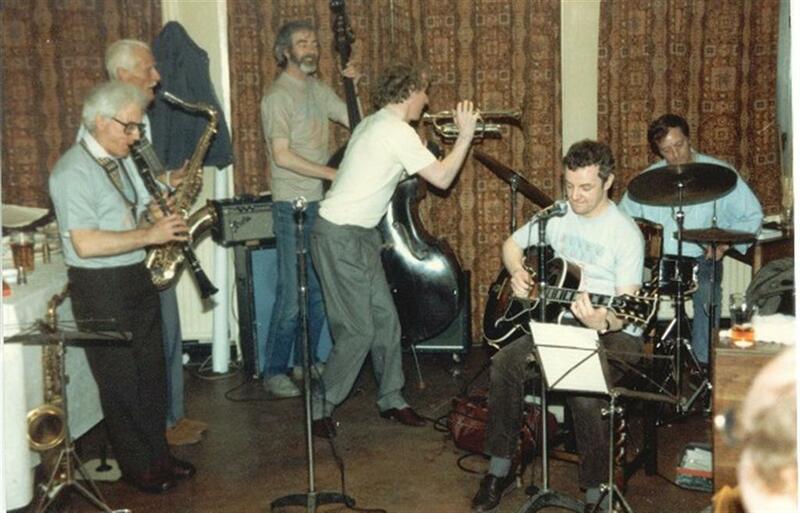 The photo right is at the Corner House, Heaton in 1984 - Charlie Carmichael alto sax, Hughie Aitchison tpt, Ronnie McLean tbn, Bill Harper pno and me on guitar (no grey hairs then!). When Clem was asked to form a new band for a weekly residency at the Golden Lion pub at Winlaton Mill he asked me to be in the band. It was a great jazz haunt – a small cellar room with great atmosphere and usually packed out with jazz fans. That residency lasted seven years – very happy times. It was there I began to sing a few songs too – I don't know how I mustered the nerve to do that. 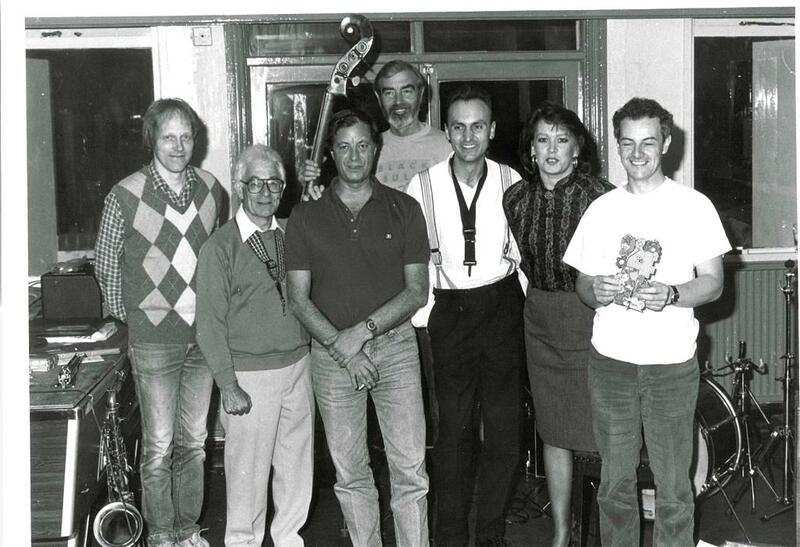 The line up was Chas Coles drms, Johnny Duncan bass, Clem tpt/vcls, Ronnie Mclean tbn and several clarinetists over the years – Danny Dunbar, Eric 'Jonty' Clegg, Bruce Bakewell with me on guitar. 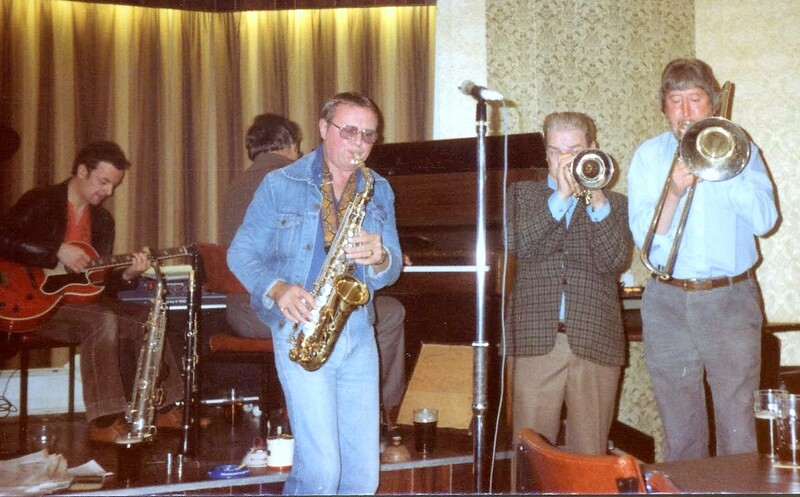 I also occasionally depped for guitarist Roy Willis with Peter Gascoigne's Saratoga Jazzmen who had a Sunday evening residency at the Corner House, Heaton. There I met Bill Smith, a lovely, gentle man who played tenor sax with a beautiful tone influenced by the likes of Zoot Sims and Stan Getz. I loved Bill's playing and we became great pals. In 1984 I happened to meet Pauline Haley who I knew from school days. She explained she had taken on the Black Bull pub at Blaydon and was trying to build up trade and activities there – would I be interested in starting a jazz residency. I mentioned it to Bill Smith and he was enthusiastic so we put a quartet together with Marshall Walker drums and Clem Avery now on double bass. 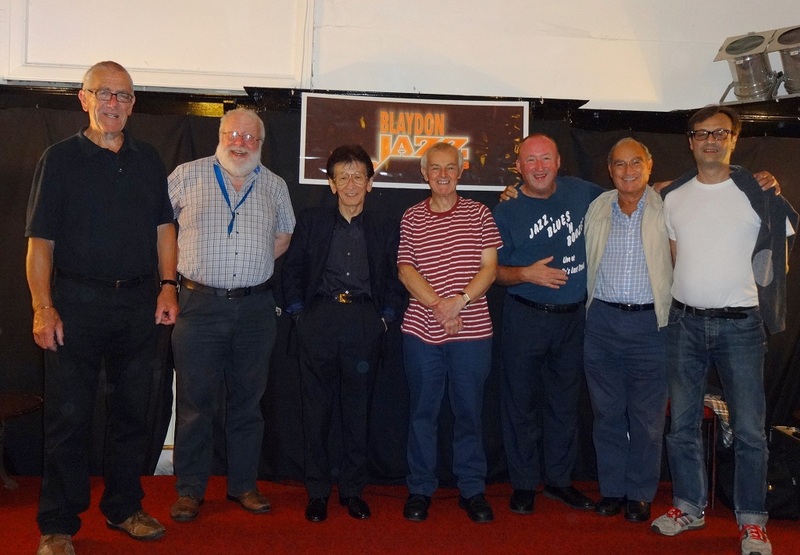 We started in September 1984 and this was the start of Blaydon Jazz Club, still going and in its 35th year now. The quartet focused on the Great American Songbook and was based around Bill's lovely tenor sax and clarinet playing. Those early years at Blaydon were great with a full house nearly every week and frequent guest players both local and national. You might like to look at the jazz club biography and photo gallery which is under separate heading on this website. My mentor Clem Avery passed away in 2008. You might like to read about him too - see the tribute to him via the home page menu. Our drummer Marshall Walker passed away in 2009 and Bill Smith died in 2015 so now I'm the only survivor of the original quartet. An honoured guest musician in the early days of the club was George Evans, who had come out of retirement and started playing again. George was internationally famous for his work as a big band leader and arranger, having started his career in the 1930s with Geraldo then moving on to have his own band with, at one stage, arrangements for a nine piece saxophone section. George was an elegant gentleman, a wonderful musician and it was a privilege to have him come and play regularly at Blaydon. It would also be in the mid 80s a pro guitarist came to the jazz club for a 'sit in'. This was James Birkett who had come up north to head up a jazz diploma course in Newcastle. We quickly struck up a lasting friendship, for some years gigging as a jazz guitar duo. We are still great pals and James regularly plays at our jazz club. 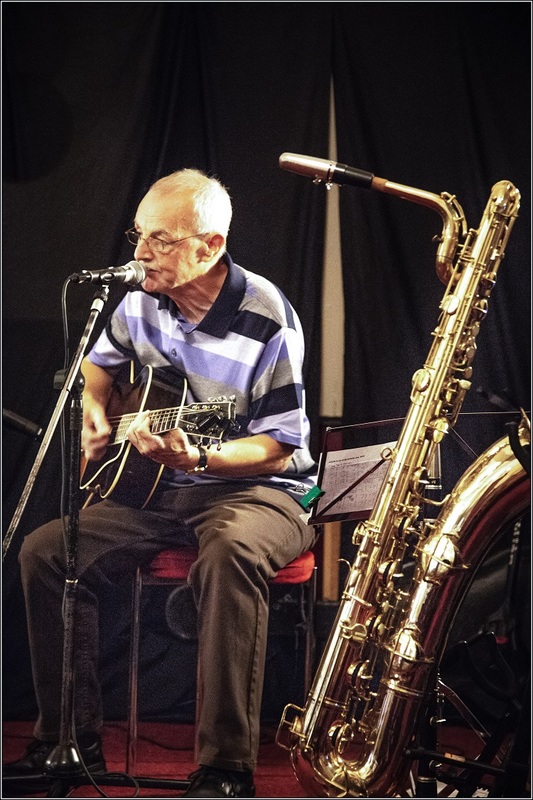 Some years after we started the club the great north east jazz pianist Bill Harper joined us and from about 1998 we had a new quartet based around his great playing. With Pete Stuart on bass, Billy Shield drums and myself on guitar. 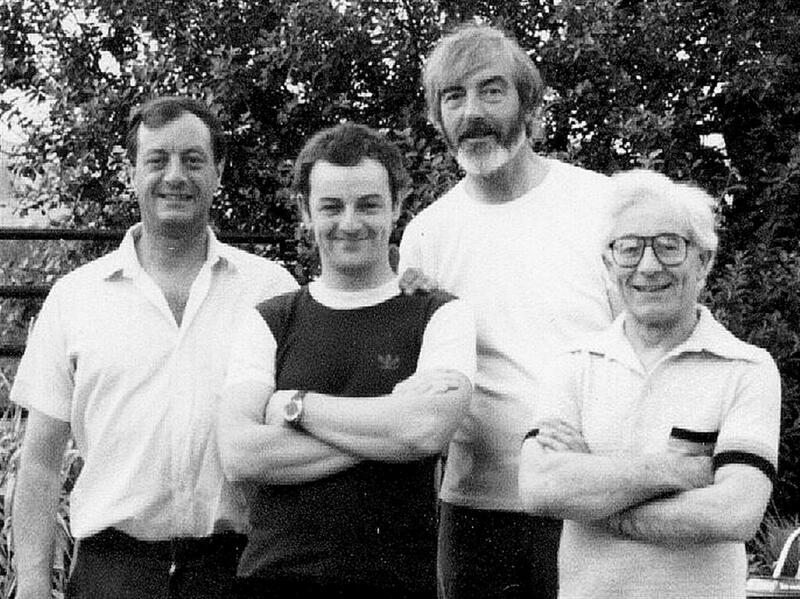 This quartet enjoyed a very successful period at the club, a weekly residency which only ended when Bill retired and moved to France. A live recording of the quartet was made at the club just before Bill left (see below). Over many years we accompanied many great guest soloists at Blaydon, top UK musicians and some international stars. Visit the jazz club biography and photo gallery via the home page and you may recognise many well known jazz artists. Some of them came to play many times and it was always a privilege. After this we moved primarily to a policy of bringing in local guest bands on a monthly basis, a policy which continues to this day. 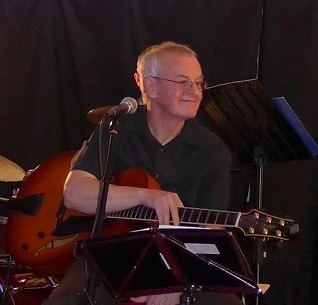 My main jazz activity has been looking after Blaydon Jazz Club but in recent years I was also involved with other musical ventures which I greatly enjoyed, among them a trio of trios. 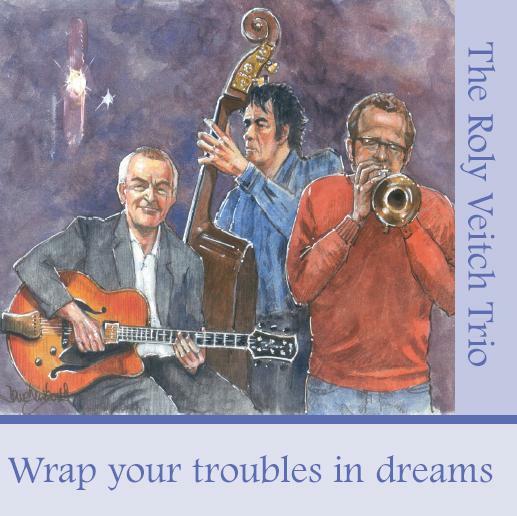 Roly Veitch Trio - for some years I had my own trio with a great Miles Davis/Chet Baker styled trumpeter Noel Dennis from Cleveland plus either Neil Harland or Andy Champion on double bass. We played quite intimate music very much in the Chet style. It was a nice unit and it really suited my way of playing. Swing City Trio - another venture was a trio with Hawk style tenor sax player Steve Andrews, a unique player in the rhapsodic pre bop style of jazz legends such as Coleman Hawkins, Chu Berry, Lester Young, Ben Webster. This was the Swing City Trio with Roy Cansdale on bass and I played 1930s style unamplified acoustic rhythm guitar. Keith Stephen's Hot Club Trio - around 2005 the late Ron Pollard, who with wife Joyce ran 'Jazz at the Fell' in Gateshead, wanted to put on a Django Reinhardt/Hot Club of France type concert. He asked Django styled guitarist Keith Stephen to put a band together and Keith somehow got my name and asked me to play rhythm guitar. 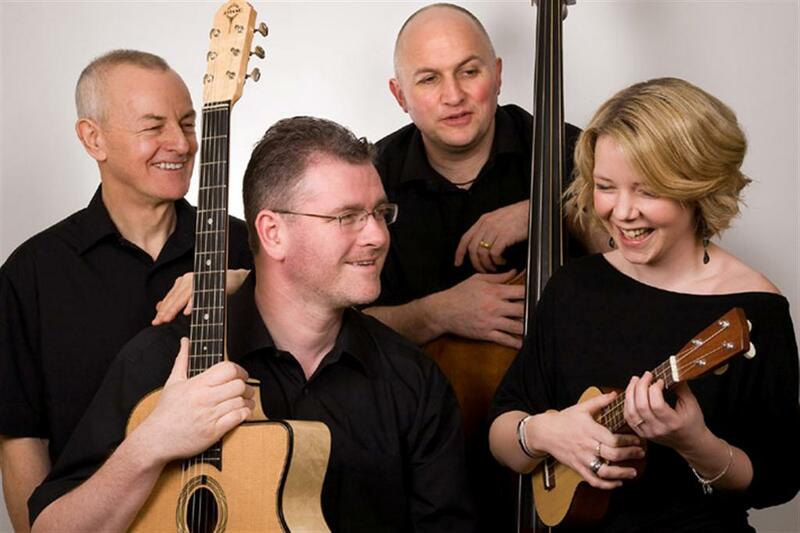 That was the beginnings of Keith's Hot Club Trio, eventually with the vivacious singer Caroline Irwin. I've listed a few YouTube videos of these three contrasting trios down below the photographs also, under that, some other recordings as detailed below. Billy Harper/Roly Veitch Quartet - this is one track from a live recording of the quartet made at Blaydon Jazz Club just before Bill retired to France (see below). Noel Dennis (tpt/flgl) with Giles Strong & Roly Veitch (gtrs), Mick Shoulder bass - this recording was made at Core Music, Hexham on 10th April 2018. Thanks to Peter of Hexhamtv for recording the whole concert and kind permission to use this excerpt. Sue Ferris (sax/flute) with Giles Strong & Roly Veitch (gtrs), Ian Paterson bass - this recording was made at Core Music, Hexham on 8th May 2018. Thanks to Peter of Hexhamtv for recording the whole concert and kind permission to use this excerpt. Dear Bix - Roly Veitch (gtr/vcl) - this home recording was made 10th August 2018. Just a single chorus of a favourite song of mine.